The Minnesota Land Trust gets many questions about how we protect land and about conservation easements in general. Conservation easements are voluntary agreements through which landowners limit the use and development of property in order to permanently preserve its natural or cultural features for public benefit. A conservation easement is a legally binding and recorded document. Learn more about conservation easements. We frequently hear from landowners wanting to enroll their land with the Minnesota Land Trust. We are eager to work with as many landowners as we can to protect their land, but completing a conservation easement (our most common method of land protection) is not a simple process nor one to be taken lightly. Please read more conservation easements, and if after that you are still interested in protection with the Land Trust, please get in touch with us. How do I know that the land is protected forever? When the Land Trust accepts a conservation easement, it is also accepting the perpetual responsibility to steward that property indefinitely. That means that the Land Trust will work with all future landowners to ensure that the conservation values protected by the easement are protected in perpetuity. We do this through regular annual monitoring visits, by staying in touch with landowners, and by being prepared to defend the easement terms legally if necessary. To ensure that the Land Trust is able to meet these obligations, the Minnesota Land Trust has created a dedicated stewardship and enforcement fund to provide a long-term, ongoing source of income to cover the ongoing, long-term costs associated with monitoring and managing our portfolio of conservation easements. The fund is also available to cover extraordinary expenses associated with managing, upholding or defending an easement should its terms or validity be at risk. 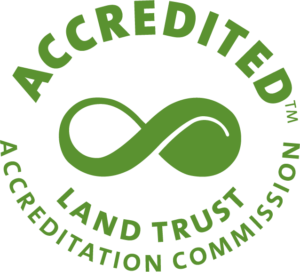 The Minnesota Land Trust is accredited by the Land Trust Accreditation Commission, and qualified to hold conservation easements under Minnesota State Law. Does the Land Trust accept all properties? No. The Minnesota Land Trust focuses its efforts on existing or restorable natural habitats that fit within program guidelines. Lands in grant funding areas are oftentimes prioritized. Do I have to allow public access? No. Although conservation easements are instruments intended to benefit the public by protecting wildlife habitat, clean water, or other identified important features to our quality of life, a landowner is not required to grant physical access to the general public. Possibly. Conservation easements may reduce a landowner’s tax obligation, particularly if part or all of the easement is donated. A gift of an easement may offer landowners favorable advantages when it comes to income or estate taxes. There may also be direct financial benefit if the conservation easement is purchased by the Minnesota Land Trust. Just like every property is unique, so is every tax situation. The Minnesota Land Trust urges you to consult a professional advisor to determine potential financial impacts. Contact our office and ask to speak with the program manager for your area about your land protection goals!